Joseph Nsiesi chronicled his escape from his homeland to inspire others and to support his fellow countrymen. Nsiesi’s memoire, “Compass of Faith,” recalls a risky escape from the Democratic Republic of Congo in 1995. An advocate for democracy, Nsiesi put his family and himself at risk for arrest and death when he spoke out. Nsiesi decided the safest course of action was to leave his family behind. He battled starvation, sickness and enemies on his yearlong journey. Nsiesi credits God for protecting him and leading him to a new life in the U.S.
Nsiesi left Congo because he disagreed with his country’s corrupt system, he said. Congo has abundant natural resources, he said, yet most of the country remains in abject poverty. Most people do not know how they will find food the next day, Nsiesi said. Nsiesi said he wrote “Compass of Faith” to signal a message to his government. Several wars took 10 million lives since 1994, he said. Rebels continue to stir trouble and cripple the government, he said. Health care is nonexistent for the average Congolese family. Nsiesi wants his book to inspire others, for those who face adversity in everyday life and who live in extreme situations such as his life in Congo. To this day, he still cannot believe he survived his journey to the U.S., he said. Nsiesi established Nsiesi’s Foundation for Disease Prevention in Congo in 2011 in addition to publishing his book. A portion of the proceeds from the book support the foundation, he said. 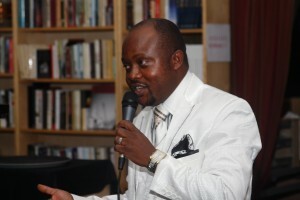 Nsiesi said as he promotes his book, he is growing the foundation. He wants to see people worldwide support the foundation. He quotes an African proverb to illustrate the power of people. “One finger cannot clean your face,” he said. When Nsiesi moved to California in 1996, he started a new vocation. The former entrepreneur and merchant started work as a nurse’s aid in a long-term care facility. The role came naturally to him, nurturing and caring for patients, he said. He felt at home taking his time with patients at the bedside, helping them eat, ensuring proper nutrition, he said. He loved working with the elderly patients and wanted to find a way to do more, Nsiesi said. Nsiesi transitioned to a hospital, and then enrolled in nursing school. He earned his BSN from the University of Phoenix. With his nursing education, Nsiesi says he can make a bigger impact in health care and with humanity. He frequently receives calls from family and friends in Congo, asking for advice and information in health care, he said. “Very, very wonderful. I love it. I can help more,” he said. Like Nsiesi, Esther Emeruehk, RN, friend and colleague, emigrated to the U.S. from Africa. Hers was a peaceful transition from West Africa, however, nothing like Nsiesi’s, she said. Emeruehk said she admires Nsiesi for his courage and kindness. “He’s a strong man,” Emeruehk said. “He is persistent. He is motivated to survive and achieve something in his life. Emeruehk cried as she read his story, she said. She recalls a passage from the book where Nsiesi watched his friend die from dysentery and nearly lost his own life, she said. The book has had the same effect on her husband and friends who have read his book, she said. Emeruehk says she plans to donate to the foundation. She said there is a big need to help people in Africa. Colleague Minh Merideth, RN, has not read Nsiesi’s book, but is aware of his foundation, she said. She said Nsiesi’s strength as a nurse lies in his report with patients. He questions things when he makes a mistake, she said, and learns from it. To donate to Nsiesi’s Foundation for Disease Prevention in Congo view www.nfdpc.org. 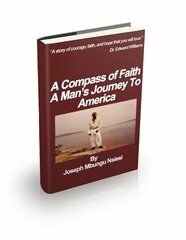 “Compass of Faith” may be found at www.thebeststoryfromafrica.com; www.bookstore.westbowpress.com;www.barnesandnoble.com; and www.amazon.com.